I was drawing at a busy mall yesterday when I had the good fortune to catch up with one of my favourite muses, old herringbones, so-called because of his herringbone pattern coat. (See, Hot off the press, posted 4th February.) This time round he had the good grace to take his Ushanka off, and in a rare moment of contemplation, paused long enough for me to capture his dour expression. I love Herringbone, it’s due for a fashion revival. I agree, I’ve seen a few young women wearing it too, will try to capture them in a drawing. Russell. And men. Lovely Harris Tweed jackets with leather patches on the elbow. Class. love how much personality you’re able to capture with such simple, bold strokes! inspiring work! Thanks Pika Blades! Happy you dropped in and commented, hope you come back. Russell. The toils of old age I suppose. Russell. His face is wonderful. Love the structure, great nose, brow, frown… Looks like he’d be a really interesting and intelligent person to talk to! There is something really captivating about this that makes it one of my all-time favourites so far! Oh! Thank you TIL., maybe my obsession with certain characters shows through when I draw them. Appreciate your comments. Russell. Wow! He looks like the writer, Samuel Beckett. Love the herringbone hair. 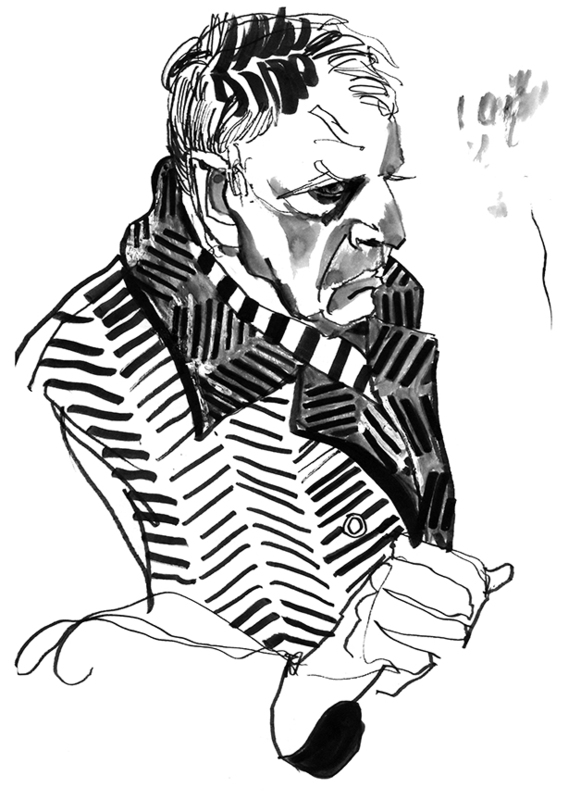 Samuel Beckett–I would love to make a portrait of Samuel Beckett. But I think I’m too late. Russell.